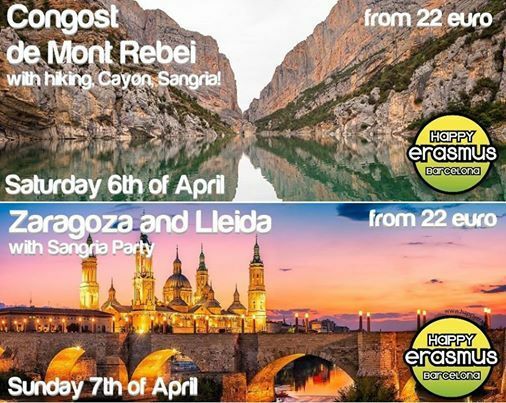 ★ 6.4 Congost de Mont Rebei ★ 7.4 Zaragoza & Lleida ★ Sangria! We will leave Barcelona from Plaza Urquinaona (Ronda Sant Pere 19, then first stop in Vila Universitaria UAB) early in the morning, in the direction of the paradise of Catalunya (Mont Rebei), where amazing hiking waits for us! We will see incredible natural places in the zone and we will enjoy beautiful viewpoints. The hiking way is not so difficult even if it is around 6 km long, about 3 hours, with stops on the way, and then another 6 km to return. The duration depends on the hikers´ ability and you can always turn around and go back if you wish. After the hiking, before to take the bus to come back, we will have time to arrive to the chapel "Ermita de la Mare de Deu de la Pertusa" and then celebrate the completed tour and make our famous Sangria Party!!! In the evening we will return to Barcelona. Crossing the gorge of Mont Rebei, the river Noguera Ribagorçana has eroded the Montsec mountains and it separates two parts: Montsec d’Ares (Catalonia) y Montsec de l’Estall (Aragon), creating impressive walls reaching more than 500 metres hig in free fall, beautiful view and heartbreaking landscape. The gorge Mont-rebei is without doubt one of the most unique natural areas in the Pyrenean foothills. It is still in natural way and hasn´t been effected by any roads or electricity lines. Ermita de la Mare de Deu de la Pertusa is a Roman Chapel, next to a ruined castle at the top of a cliff. A spectacular viewpoint over the Canelles reservoir and the Noguera Ribagorcana river, it is also a great place for birding and seeing birds in flight such as golden eagles, peregrine falcons and bearded vultures. We will take our bus early in the morning from Plaza Urquinaona (Ronda Sant Pere n.19, then first stop in Vila Universitaria UAB) and we will go in Zaragoza to visit the most important and symbolic places with a local profesional guide who will tell us the secrets of the city and its monuments. During the complete tour of the capital of Aragon the guide will tell us all of its history. We will also have free time in to wander around the streets, try the delicious cuisine (you have to try the lamb or the chicken!) and to buy some souvenirs. After lunch and throw our famous Sangria Party we will go to Lleida. There we will have a walking tour in the city, we will visit the historical center and the Seu Vella. In the evening we will head back to Barcelona, where we will arrive around dinner time. The history of Zaragoza dates back over 2,000 years and still has many traces of the past. Inhabited since the bronze age, it has Iberian origins dating from the third century and throughout the centuries it has been home to Romans, Muslims, and almost all civilisations that have occupied the Iberian Peninsula. It was the capital during the Aragon reign (which upon joining the Kingdom of Castille gave rise to the current Spain) and the headquarters where they crowned all of the kings of Aragón for hundreds of years. Today Zaragoza is the fifth most populated city in Spain and it joins modernity, tradition and history with elegance and pride. It is situated along the river Ebro, the largest river in Spain whos beauty reflects the beauty of the two cathedrals (the Catedral-Basílica de Nuestra Señora del Pilar de Zaragoza, and the Seo o Catedral del Salvador de Zaragoza) and the city. It's group of Moorish monuments consists of the Patrimonio de la Humanidad, the impressive basilica of Pilar home to one of our most famous and well known painters: Goya and the Plaza de la Hispanidad is a place immortalized through pictures. It will be a very special day! You will be impressed by the Basílica del Pilar nestled in the gigantic and wonderul square with the same name. It's enormous and elegant but at the same time light and delicate. Its eleven domes and four bell towers make it seem even larger. It's Baroque style and the Marian shrine (dedicated to the virgin Mary) is the oldest in Spain and possibly in the world. Inside you can see paintings from none other than Goya, as many from his early days as his more mature work. The basilica is dedicated to the Virgin of Pilar, who is the patron of Spain. In fact, the 12th October is the día de la Hispanidad (Columbus day in America) and we dedicate this same day to the Virgin of Pilar. It is the city that borders the wide river Ebro. The rivers in Spain are not usually very big, so we are always impressed by the width and majesticity of this river. There are various bridges crossing the river such as the Puente de Piedra from the fifteenth century with seven beautiful arches and the current and modern Puente del Tercer Milenio which leads to the most fururistic part of the city. Lérida (in Catalan- Lleida) is a Spanish city, capital of the same name province, located in the Catalan autonomous community. It has a population of 137 327 inhabitants in its urban region. After Barcelona, Lérida is the second most important and the second biggest Catalan city. From the 6th century until the Roman conquest, Lérida became the main city of the ilergetes, an Iberian tribe that named the city Iltirta. The Romans named it Ilerda and in the times of Emperor Augustus it received the status of a municipality. Between 716-719 the city was invaded by Muslims and reconquered by the troops of Ramón Berenguer IV and Ermengol VI in 1149. In 1150 Lléida received the status of township. The most important assets of cultural interest located in the municipality include two cathedrals. The first is La Seu Vella, which is the symbol par excellence of the city. Its tower stands out above the other buildings of the town and its cloister is a marvel of Gothic architecture and one of the largest in Europe. The second is La Seu Nova which is located in the centre of the city, opposite the Old Hospital of Santa Maria. It is an eighteenth-century building that was built because La Seu Vella had suffered much damage during the War of Succession and it started serving as military barracks. Its interior is pleasant, in classicist baroque style and houses an image of the Virgin of Montserrat. Another important monument found in the city is the Palace of the Paeria. The building is located in the middle of the commercial street and serves as a house of the City council. 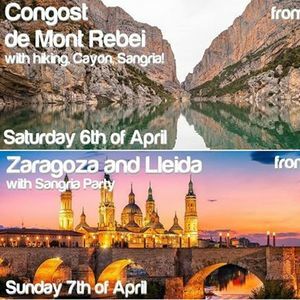 ★ 6.4 Congost de Mont Rebei ★ 7.4 Zaragoza &amp; Lleida ★ Sangria!